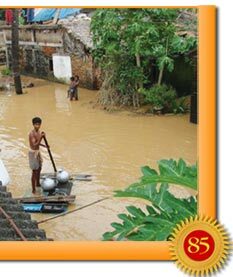 During the third week of September 2008, a devastating flood surged across the eastern part of the Indian state of Orissa. 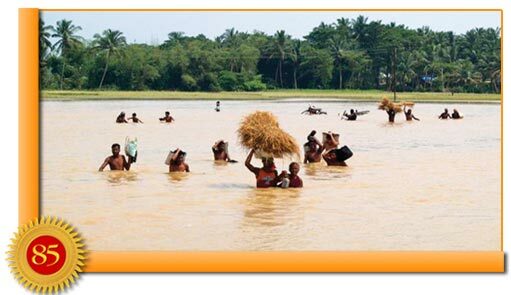 Although a small number of lives were lost, millions living in the coastal districts were affected by the flood waters. It is estimated that over two million people were marooned by Nature’s fury. 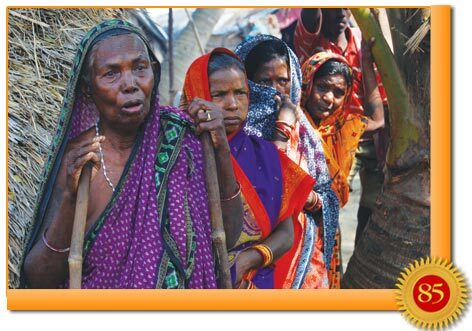 Over 400,000 hectares or a million acres of paddy crop were destroyed in areas where 70% of the population is dependent on agriculture for a living. At least 2,500 villages were completely submerged. The loss of lives, however, was less than 50 because of the forewarning that made tens of thousands flock to higher land. The Chief Minister of the state urged the Central Government to declare the tragedy a national calamity and requested the assistance of 15 billion rupees or US$300 million to undertake rescue and relief operations. 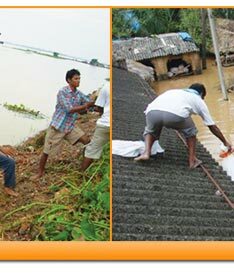 In conversation with several of the affected people of Orissa, this issue of H2H delineates the extent of the catastrophe. 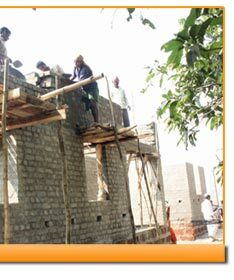 It also outlines the impact of relief work undertaken by Sai workers on the instruction of Bhagavan’s timely gesture. Mrs. Pushpalata Behera, a village resident, Manibad, Cuttack District, recalls: “On 17 September, the volume of water was high but well within the height of the embankment. But the next day, it reached dangerous levels. To our shock, we found in one area, the heavy force of the water was eroding the base of the bank. Now, we were left with only eight to ten sand bags. “At five the next morning, all hell broke loose. We collected our families and kept running till we found a concrete building. We climbed on top of this and stayed there for four days. All we had to eat was a few biscuits that we managed to carry as we fled in the early hours that day, and this was over in no time. 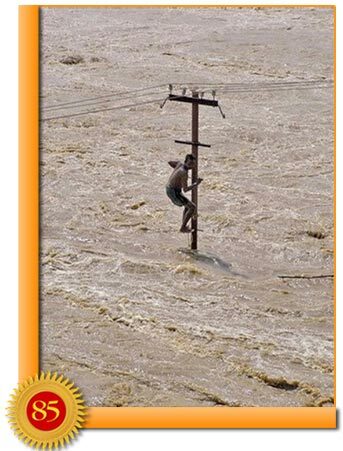 Even though floods are not uncommon to Orissa, the magnitude of the disaster numbed everybody. 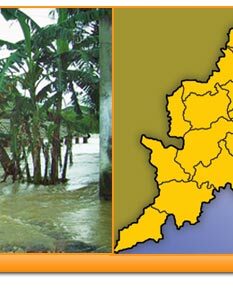 Strong winds and a severe depression in the Bay of Bengal led to heavy rains in the area. 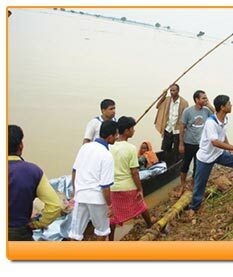 As a result, the Mahanadi River swelled causing numerous breaches in the river’s embankments. 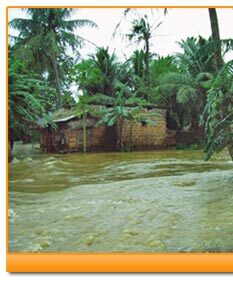 Not only the Mahanadi, but many of her tributaries overflowed too, each mercilessly submerging hundreds of villages on its way. The State’s Hirakud Dam was filling rapidly as a consequence of the heavy downpour. When the water level approached maximum capacity, the officials had no option but to open the sluice gates. Over half the gates were opened causing hundreds of thousands of cubic meters of water per second to cascade onto the coastal districts below. This caused great havoc, adding water to the swollen rivers and contributing substantially to the disaster. In previous weeks, the operators had permitted the water level to rise above the recommended height, so there was no flood cushion when the heavy downpour occurred. The government did undertake immediate steps, and evacuated thousands. There were two helicopters in service to locate those who were stranded. Other aerial vehicles dropped food, clothes and other life-saving materials. However, their relief operations were grossly inadequate and often mismanaged. A Heart2Heart team from Radio Sai reporting from the village Billipada, Puri District, observed collapsed mud houses, uprooted trees, unclothed and undernourished children, stray and skinny cattle, and downcast women struggling to cook a meal in the open kitchens. Amidst the scene of devastation, they were surprised to see an old lady smiling. She picked up a little one from the ground, probably her grandchild and fondling the baby continued: “I do not know how we all survived. We stayed on the rooftop of a house on a piece of polythene for as long as eight days. We lost everything and had nothing to eat. We fell horribly sick. I have been an asthma patient for the last 18 years, and during those days, I went completely hungry for three days at a stretch. And this trial continued until the Sai Baba volunteers found us. When they noticed our condition, they offered us cooked rice, dal, biscuits, drinking water, medicines and clothes. 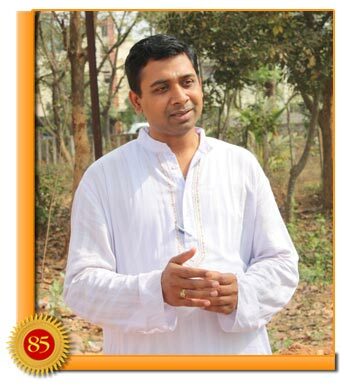 Mr. Narayan Sar, the Joint Youth Coordinator of Sri Sathya Sai Seva Organisations, Orissa, reminisces: “When we heard of the ravaging flood, we were in a state level meeting in Bhubaneswar. The Sai Youth immediately formed a task force and toiled virtually 24 hours non-stop for ten days to help save the lives of thousands. Akshay, a young Sai worker, shares: “We left early in the morning every day carrying the ready-to-eat food packets made over night by our Sai Youth sisters. We went into the interior and isolated areas where no government or any other external aid had reached. The Sai Youth contingent of about 300 bought new clothes for men, women and children and offered food packets that would last each beneficiary at least 15 days. 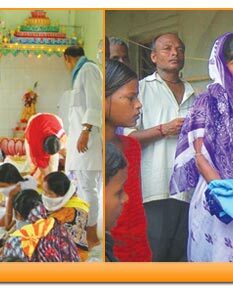 Guided by Bhagavan’s personal example, the volunteers delivered all these services in the spirit of total reverence and love. The All India Sai Organisation provided one and half crore rupees worth of medicines, clothes, blankets, polythene sheets and other essential supplies. Narayan Sar adds: “It was a very fulfilling experience as we could provide those afflicted with food in time and also gift them woollen clothing before the onset of the winter season. However, it was a very touching endeavour for other reasons. “In one village, before distributing the relief material, we selected the most devastated families and gave them tokens for identification. We had only 1,000 tokens. There were a few people who were left out. Now, these villagers started crying, literally, not because they were being deprived of the packets, but because they felt they were so unfortunate that even Sai Baba did not want to bless them. This very thought was more painful to them than the trauma of the flood. Seeing their heartrending love for Bhagavan, our eyes too overflowed. 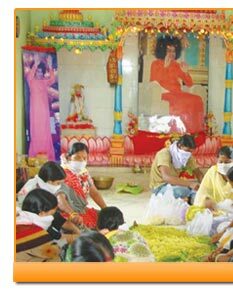 While the Sai Organisation was delivering supplies and providing comfort and solace in Orissa, the prayers of those who had lost hope of piecing their lives together, reached the Powerhouse of Compassion, Bhagavan Baba. 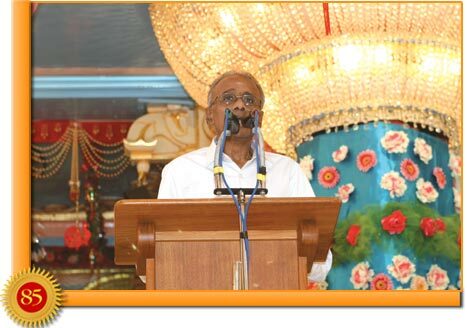 The prayers came in the form of Mr. V. Srinivasan, the All India President of Sri Sathya Sai Seva Organsiations. 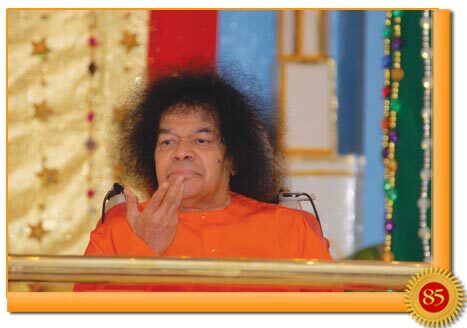 In a meeting with Baba during the Dussera celebrations, he presented pictures of the devastation and the Sai seva activities that were ongoing. Baba then gave instructions to his distinguished engineering team consisting of Mr. Kondal Rao and Dr. A. Ramakrishna to leave for Orissa. They did so, surveyed the four severely affected districts, and reported back to Baba the extent of the damage including an estimate of the number of houses that needed to be built. 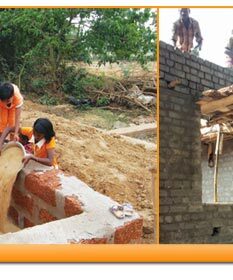 To this exalted team was added, the civil engineer Mr. C. Prusty of the Sri Sathya Sai Central Trust. Sent again on 3 November, the three met with officials of the Secretariat of the State Government of Orissa. This panel discussed details for the construction of houses and acquiring of land. They needed to work out how to identify the beneficiaries of this project, and the financing and logistics of the entire programme. After the second trip concluded successfully with all the issues sorted out, Baba was eager for the work to start immediately. 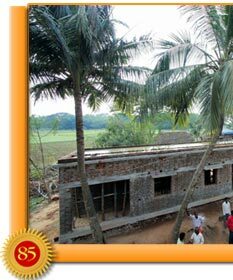 And for this, He instructed Mr. Prusty to return to Orissa, establish himself there and oversee the entire project. At the end of November, less than two-and-a-half months after the onset of the disaster, the first groundbreaking ceremony was performed. 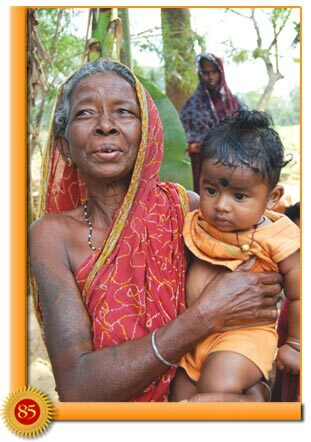 This was in the village of Nadiabarai in the district of Kendrapada. In a matter of 15 days, work was in progress in five simultaneous sites, and the number grew to 12 by the end of the first 30 days. 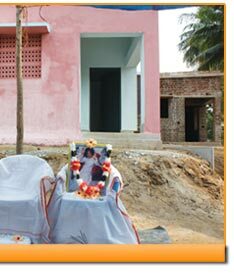 Regarding the acquiring of land, Mr. Ramachandra Swain of the Sri Sathya Sai Seva Organisations, Kendrapada, said: “The issue of land ownership in these villages is a very sensitive one. Often people could come to blows because of such conflicts, as no one would be prepared to concede even an inch. 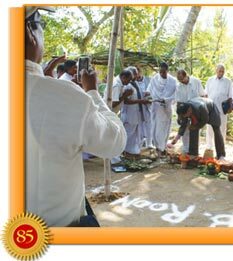 But as far as the project was concerned, they were so moved by Bhagavan’s gesture that they forgot their conflicts and gladly offered their lands, sometimes at lower than the prevailing market price. “I must share with you a small but delightful incident. At one point, we needed an additional plot of over 2,000 square feet. 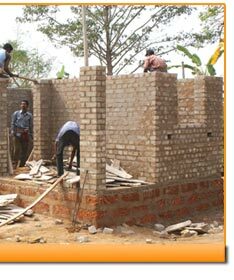 This was to add more houses to the row of construction in the village of Samsara. The owner of this additional plot of land promised to give it to us, but for some reason dilly-dallied. I was in a state of tension as the deadline to submit the papers was fast approaching. I did not want to present a plan that had many deserving landless persons being left out. “I prayed hard that night. The next morning, unexpectedly, the owner’s son landed from Mumbai and handed over the relevant papers. 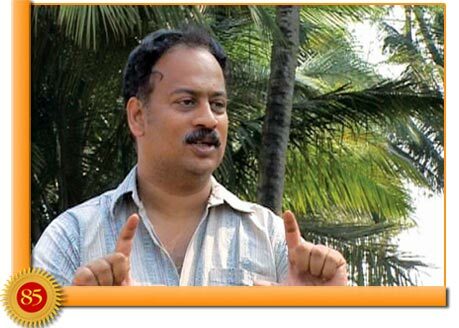 Mr. Sridhar, director of a construction company which was initially involved in the construction, commented: “From a construction standpoint, the uniqueness of the project was also its major challenge. Here we were building houses for people who would never have dreamt in their lives of having such permanent homes, and it was happening right in front of their eyes. While this gave a great feeling, the flip side of it was that all the houses were scattered widely. 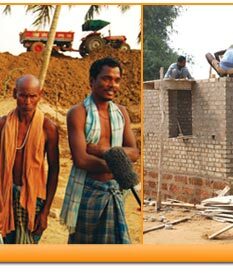 To construct 5,000 houses in one fixed site that has easy access to raw material and good roads is not so challenging as building 500 houses spread over more than a dozen locations that are remote and isolated and have pathetic connectivity in all respects. “For example, the distance between the first and second site was 200 kilometres. Similarly, parallel work was going on in 12 sites. To monitor all of these simultaneously and conform to the strict timetable was no mean task. Besides, even within one village, the huge distance between the houses, sometimes hundreds of meters, posed a great test. Therefore, the sheer width, scope and location of the project were huge differentiating factors. “But at the same time, the most amazing thing about the whole endeavour was that we were able to do it. I still cannot believe that it could be made to happen. 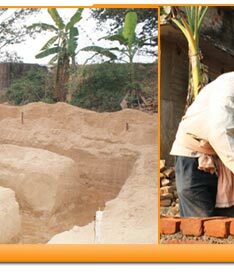 For example, in a couple villages we performed the ground-breaking ceremony and soon after we were to start the construction. Before this, however, we had to finish the layout of every house, and it was taking one day to come up with the drawing of one house. As there were 51 houses, this meant two months. I was not getting anywhere. 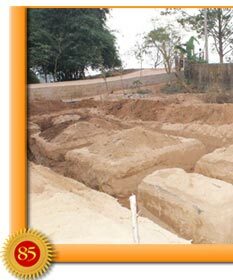 Bhagavan had instructed that the houses be built at a higher ground level to protect them from subsequent heavy rains. 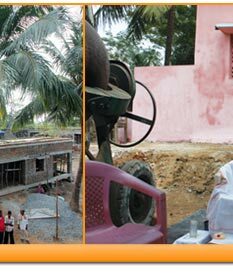 Overseeing the project, Mr. Prusty meticulously ensured that the best construction practices were utilised to provide each house with a solid foundation and a specially strengthened superstructure. Mr. Prusty recalls how while walking a few members of the H2H team through one of the sites, he had pointed towards a semi-completed house where small children along with their parents were pouring water on the walls of the new construction. He said: “It was heartening to see that without the need for prompting, people were willingly carrying water and curing the brick work. 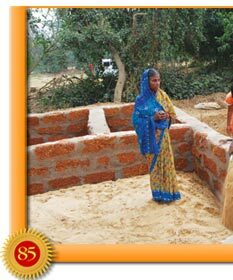 We saw two little kids lugging small bags of sand in a mason’s pail and filling the plinth of the houses enthusiastically. It was absolutely moving. Mr. Prusty said that the first house that was completed served as a model. Pictures of it were sent to Baba. The team was delighted to know that the progress had met with His expectations. A woman from the group said: “Our eyes are filled with tears of joy. Who else, but God, can give us such a beautiful home?” As she spoke those words, her voice was choked and she bent her head to wipe her overflowing eyes with a corner of her saree. Another resident spoke up: “Until the floods, we had no idea who Sai Baba was. After we lost everything to the waters, survival had become very difficult. It was at that time that a few people came to our village, and presented us with rice, sugar, candles, and blankets. More than this, they helped us to clear the mud-filled hole, which was once our house. They spoke to us very lovingly. “They assured us that they would take care of us, and help us rebuild our ruined home. They checked our health too and brought us medicines. And later new clothes. When we asked them who they were, they said Sai Baba has sent them. It was only then that we heard about Sai Baba. The man responded: “No sir, not in the least. I am enjoying this. 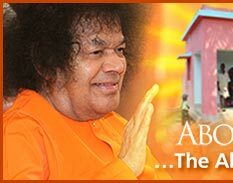 Sai Baba is giving us these houses. We are extremely happy. 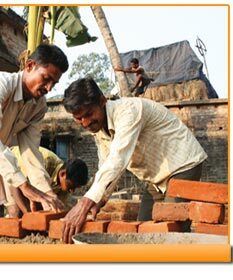 We are poor labourers. We work for a daily wage. Even in our wildest imagination we could never build such homes for ourselves. For years, we have lived in thatched houses which get destroyed every other season. We had thought concrete houses are not for people like us. But Sai Baba is so kind. He is making us such beautiful homes. 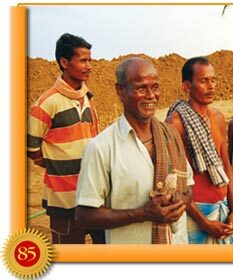 The worker’s eyes glistened with tears of gratitude. 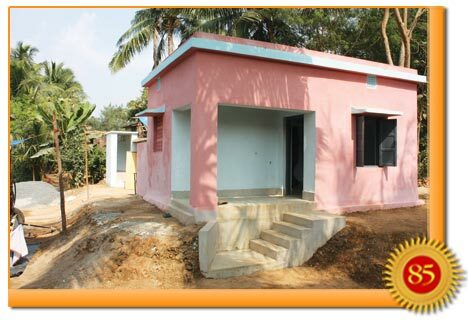 The first batch of the houses - about 200 of them - was ready within four months of construction. 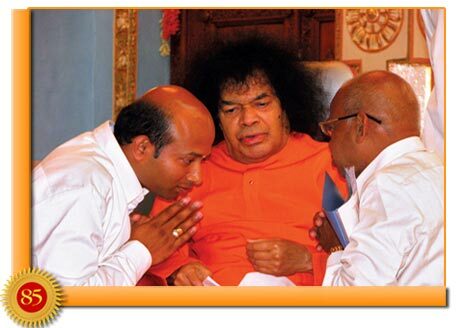 Swami had agreed to present the keys to the poor beneficiaries. 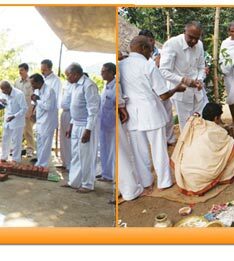 On 2 April 2009, all of them were brought to Prashanti Nilayam. 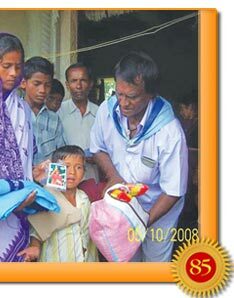 New clothes were first distributed to them. Many of them broke down and tears flowed freely down their cheeks. Some of the women refused to rise after falling prostrate on the ground. Like a tumbler that falls flat on the floor and empties all the water within, the recipients rose leaving the portico wet with their tears. They literally had nothing else to offer and it was for the first time in their lives that someone had valued their cries so much. The next day in their new clothes, they were grouped by family in the Sai Kulwant Hall. As Baba looked on, the keys to their new dwellings were distributed to them. Each family was also given a hamper that contained mats, vessels, plates, tumblers and ladles - items that are vital but deprived from the lives of the less privileged. The happiness radiating on their faces and joyful tears welling up in their eyes made one wonder whether the ravaging floods were really a curse upon them. It had, in reality, brought them to the feet of the Lord and made them the beneficiaries of His grace and bounty. 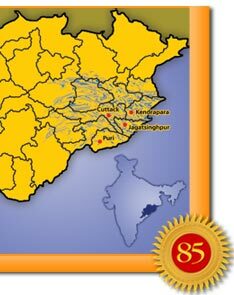 In that sense, another flood swept the coastal districts of Orissa. This one cleansed from the minds and soul the horror and desolation inflicted by its predecessor. 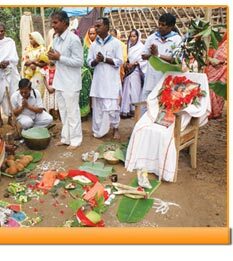 As flood of love expands over the region bringing positive, life-changing developments, it unifies divided villages and instills in the inhabitants a sense of gratitude and pure adoration for the Divine.